Professor Robert Franklin and Candler students visit Musee Ogier-Fombrum, a museum built around remnants of a sugar cane plantation built in 1760 and abandoned during the country’s revolution, led by self-liberated slaves. 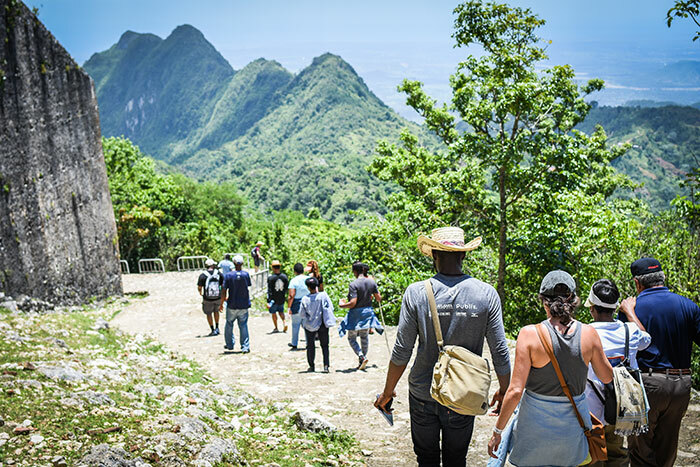 Seminar participants explore the Citadelle Laferrière, a large mountain-top fortress built by a leader of the Haitian slave rebellion, located south of Cap-Hatien. Franklin (right side, center) leads a conversation with Haitian Senator Patrice Dumont (left side, center) during the group's visit to Haiti. Participants in the Moral Leadership travel seminar visit a church located high on a mountaintop in Arcahaie, Haiti. 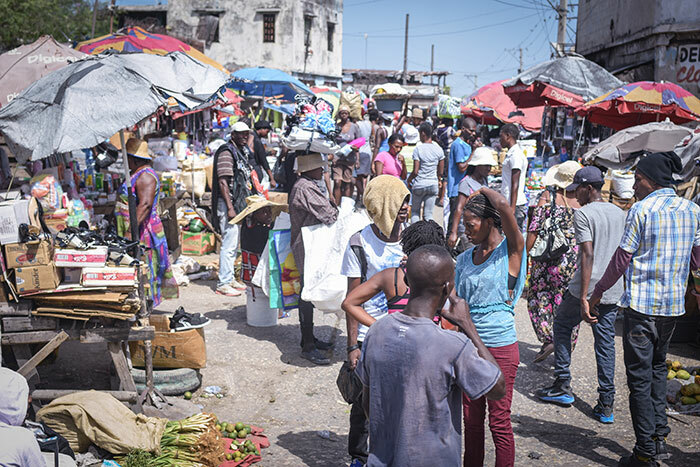 Traveling to Port-au-Prince, Candler School of Theology graduate students passed street markets bustling with the thrum of commerce and community. 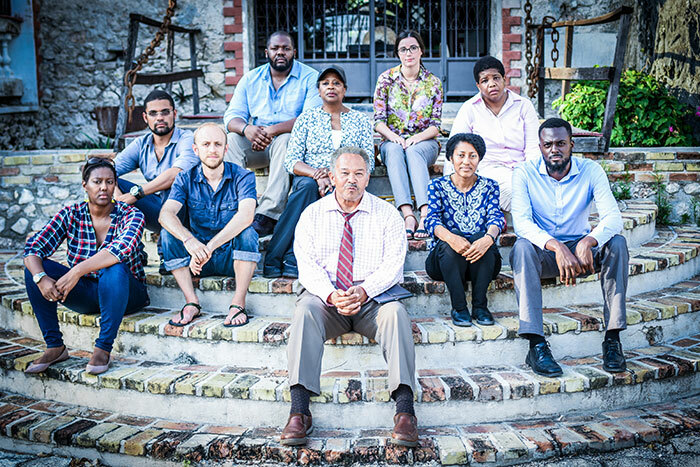 Graduate students in Candler School of Theology traveled to Haiti for a 10-day seminar in moral leadership led by professor and public theologian Robert Franklin, visiting with artists, academics, and spiritual and political leaders. Photos courtesy Orlando Evans/Bowtie Photos, LLC. Orlando Evans has long known of the challenges facing Haiti, a Caribbean nation that has struggled in the wake of a devastating 2010 earthquake — with in-laws of Haitian descent, he feels a special connection. But it wasn’t until he walked down humble dirt roads and through the nation’s halls of power that Evans fully appreciated the sharp inequity in wealth, education, health services and opportunities for advancement that shape Haiti as a perplexing land of extremes. “It’s one thing to talk about moral leadership and the absence of moral leadership, and another thing altogether to see the impact it can have on a group of people,” says Evans, a former banker and financial consultant now studying for a master’s of divinity degree at Emory’s Candler School of Theology. “We saw what appeared to be 99 percent of people living in poverty and 1 percent living in power and wealth — such a huge and overwhelming disparity,” Evans says. “If you are wealthy in Haiti, chances are your children will be wealthy. If you are poor, your children will be poor, without any way to transition out of the cycle. 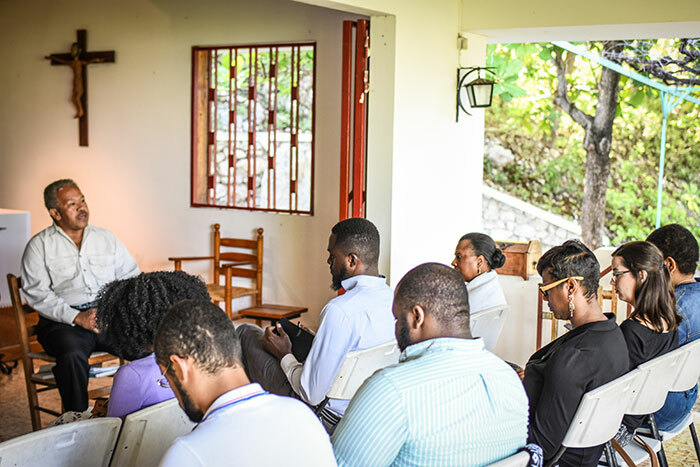 Evans was among nine Candler graduate students who traveled to Haiti for a 10-day seminar in moral leadership led by Robert Franklin, public theologian and James T. and Berta R. Laney Professor in Moral Leadership at Candler. 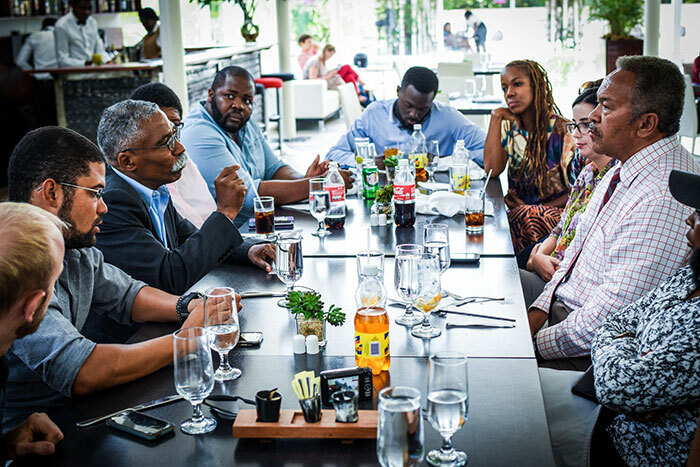 From May 23 to June 1, the group examined moral leadership in context by visiting with artists, academics, and spiritual and political leaders who are considered “important moral agents in their communities and country,” says Franklin. Stabilizing society after rapid changes of government. Each day included an evening salon where participants discussed issues and events. In addition to lectures, readings and coursework, the students will also produce a final paper or project “which focuses on how we as Americans can change the narrative about Haiti in the U.S.,” Franklin says. This is the second international travel seminar that Franklin has led through Candler’s James T. and Berta R. Laney Program in Moral Leadership, which he chairs. In 2015, he accompanied Candler students enrolled in his moral leadership class on a 10-day trip in South Korea. “We typically look for places where there is volatility and moral and social ambiguity in the society, where there is a need for women and men who act with integrity, courage and imagination to serve the common good,” says Franklin, who also serves as senior adviser to Emory's president. “In Haiti, there is currently a concern over public and private corruption, rebuilding efforts after the earthquake, and a need to celebrate the resilience and genius of the Haitian people,” he notes. Among the nation’s ethical concerns: How $16 billion in international relief support raised following the earthquake was actually used. “We were pressing the question of where did the money go and were people actually being helped,” Franklin says. Adding to the trip’s interdisciplinary dialogue were Francine Allen, a part-time graduate student at Candler and assistant professor of literature at Morehouse College; Kali-Ahset Amen, assistant director of Emory’s James Weldon Johnson Institute for the Study of Race and Difference, a political sociologist who has taught courses on global inequality and international development at Emory; and Cheryl Franklin, a physician and assistant professor of obstetrics and gynecology in Morehouse School of Medicine who serves as medical director for Morehouse Healthcare. For Amen, the trip marked her first journey to Haiti. “It was great being a sociologist among a group of divinity scholars who’ve made it their business to inculcate hope and inspiration into the hearts of people,” she says. Amen praised the immersive nature of the experience. “Everybody that we spoke to, whether a politician or artist or health care worker, introduced a different kind of knowledge base that fed our integrated and interdisciplinary approach to learning and engagement," she says. "Each encounter deepened our sense of solidarity with the Haitian people and their aspirations for the future." For Marcus Larivaux, a third-year master’s of divinity student at Candler who aspires to be a pastor, the trip was fed by a curiosity that stretched beyond strictly academic scholarship. “Both of my parents were born in Haiti, and though I grew up immersed in Haitian food and culture and speaking Haitian Creole, I had never been there,” Larivaux acknowledges. “In some ways, it felt like this was the next step in my cultural development and self-actualization,” he says. Along the way, he especially enjoyed tackling challenging questions. “It was a class and it was work and it wasn’t easy — but wrestling with moral and ethical issues is never easy,” Larivaux says. “There were points where we were challenged to speak up on things we felt were immoral in their society or our society, to hold conversations and discuss ways we are complicit in a system that oppresses people all over the world — these are difficult conversations to have. “But I come away feeling the need to look at myself and say ‘What is my responsibility as a member of the Haitian diaspora? How can I give back? How can I become a moral leader and make the world a better place?” he says. Evans, now a campus pastor at Impact on Main church in Atlanta, also feels compelled to take action. “One thing I would like to do is contribute to an effort to collect shoes or raise money for shoes to be sent to Haiti to help those children walking barefoot up and down hills and mountains and dirty roads,” he says. In the end, the journey came full circle for Evans. “My mother always told me stories about talking Creole with her grandfather when she was a little girl in New Orleans, and when I married into a Haitian family they were surprised I knew so much about their food profiles,” he says. In fact, while in Haiti, he found himself eating the very kinds of dishes his own mother had once prepared. When he mentioned it, a host pointed out that his family was likely part of a massive migration from Haiti to Louisiana in the late 1700s and early 1800s. “They told me that my grandfather was probably part of that migration,” Evans says. “Being there, I kind of felt connected. It’s hard to explain, but as an African-American you don’t always know where you came from. “I’d like to make sure my own children understand that piece of the puzzle,” he adds.